Nearsightedness is when light entering the eye is focused incorrectly. This makes distant objects appear blurred. Nearsightedness is a type of refractive error of the eye. People are able to see because the front part of the eye bends (refracts) light and focuses it on the retina. This is the back surface of the eye. Nearsightedness occurs when there is a mismatch between the focusing power of the eye and the length of the eye. Light rays are focused in front of the retina, rather than directly on it. As a result, what you see is blurry. Most of the eye's focusing power comes from the cornea. Nearsightedness affects males and females equally. People who have a family history of nearsightedness are more likely to develop it. Most eyes with nearsightedness are healthy. However, but a small number of people with severe nearsightedness develop a form of retinal degeneration. A nearsighted person sees close-up objects clearly, but objects in the distance are blurred. Squinting will tend to make far away objects seem clearer. Nearsightedness is often first noticed in school-aged children or teenagers. Children often cannot read the blackboard, but they can easily read a book. Nearsightedness gets worse during the growth years. People who are nearsighted need to change glasses or contact lenses often. Nearsightedness most often stops progressing as a person stops growing in his or her early twenties. A nearsighted person can easily read the Jaeger eye chart (the chart for near reading), but has trouble reading the Snellen eye chart (the chart for distance). Wearing eyeglasses or contact lenses can help shift the focus of the light image directly onto the retina. This will produce a clearer image. 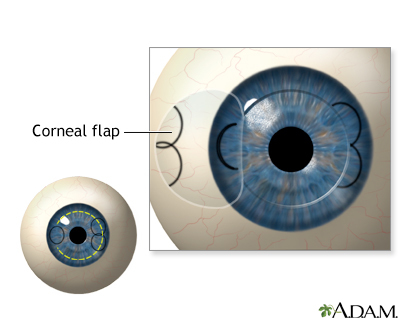 The most common surgery to correct myopia is LASIK . 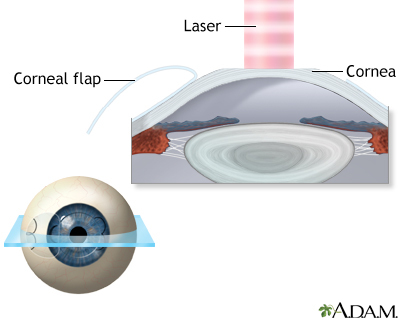 An excimer laser is used to reshape (flatten) the cornea, shifting the focus. Early diagnosis of nearsightedness is important. A child can suffer socially and educationally by not being able to see well at a distance. 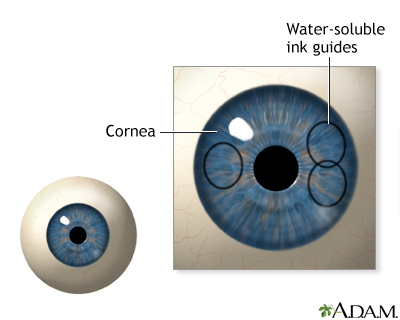 Corneal ulcers and infections may occur in people who use contact lenses. Rarely, complications of laser vision correction may occur. These can be serious. People with myopia, in rare cases, develop retinal detachments or retinal degeneration. It has been generally believed that there is no way to prevent nearsightedness. Reading and watching television do not cause nearsightedness. In the past, dilating eye drops were proposed as a treatment to slow the development of nearsightedness in children, but those early studies were inconclusive. However, there is recent information that certain dilating eyedrops used in certain children at just the right time, may decrease the total amount of nearsightedness that they will develop. The use of glasses or contact lenses does not affect the normal progression of myopia -- they simply focus the light so the nearsighted person can see distant objects clearly. However, it is important to not prescribe glasses or contact lenses that are too strong. Hard contact lenses will sometimes hide the progression of nearsightedness, but vision will still get worse "under" the contact lens. Chia A, Chua WH, Wen L Fong A, et al. Atropine for the treatment of childhood myopia: changes after stopping atropine 0.01%, 0.1% and 0.5%. Am J Ophthalmol . 2014;157(2):451-457. PMID: 24315293 www.ncbi.nlm.nih.gov/pubmed/24315293 . Garg S, McColgin AZ, Steinert RF. LASIK. In: Tasman W, Jaeger EA, eds. Duane's Ophthalmology 2013 ed . Philadelphia, PA: Lippincott Williams & Wilkins; 2013:vol 6, chap 49. Olitsky SE, Hug D, Plummer L,Stahl ED, et al. Abnormalities of refraction and accommodation. In: Kliegman RM, Stanton BF, St. Geme JW, Schor NF, eds. Nelson Textbook of Pediatrics . 20th ed. Philadelphia, PA: Elsevier; 2016:chap 620. White PF, Scott CA. Contact lenses. In: Yanoff M, Duker JS, eds. Ophthalmology . 4th ed. Philadelphia, PA: Elsevier Saunders; 2014:chap 2.7. Whitmore WG. The Optics of Myopia. In: Tasman W, Jaeger EA, eds. Duane's Ophthalmology . 2013 ed. Philadelphia, PA: Lippincott Williams & Wilkins; 2013:vol 1, chap 42. Zadnik K, Mutti DO. 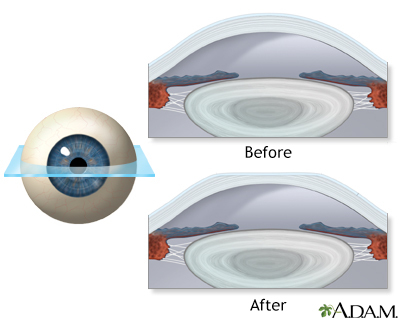 Biology of the eye as an optical system. In: Tasman W, Jaeger EA, eds. Duane's Ophthalmology . 2013 ed. Philadelphia, PA: Lippincott Williams & Wilkins; 2013:vol 1, chap 34. Normal vision occurs when light is focused directly on the retina rather than in front or behind it. A person with normal vision can see objects clearly near and faraway. Nearsightedness results in blurred vision when the visual image is focused in front of the retina, rather than directly on it. It occurs when the physical length of the eye is greater than the optical length. For this reason, nearsightedness often develops in the rapidly growing school-aged child or teenager, and progresses during the growth years, requiring frequent changes in glasses or contact lenses. A nearsighted person sees near objects clearly, while objects in the distance are blurred. Farsightedness is the result of the visual image being focused behind the retina rather than directly on it. It may be caused by the eyeball being too small or the focusing power being too weak. Farsightedness is often present from birth, but children can often tolerate moderate amounts without difficulty and most outgrow the condition. A farsighted person sees faraway objects clearly, while objects that are near are blurred.